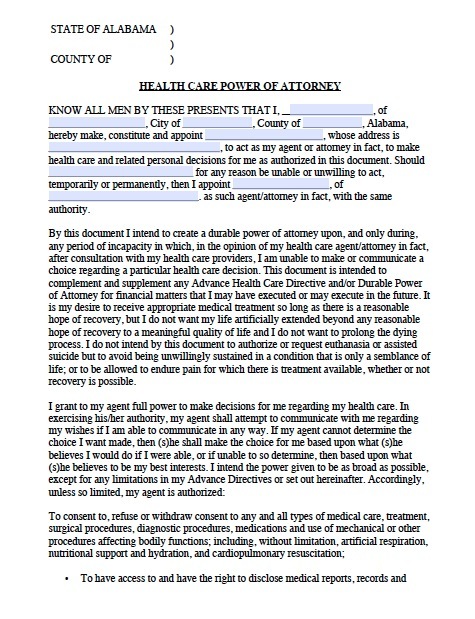 Alabama Medical power of attorney is another important legal tool that helps in the unfortunate event that you lack the ability to make decisions about your medical care, this document entitles another person to do so. This includes the types of treatment you would or would not like to receive. For example, if you become terminally ill or permanently unconscious, you can specify that you would like to end life-sustaining treatment in that circumstance. If you do not enact a medical power of attorney, the control over your medical care could fall to an estranged family member, a doctor, or even a judge. The document does not give the agent the right to make healthcare decisions for you while you retain the capacity to make them yourself. Again, it is important to choose someone you trust as your agent, and someone who is prepared to argue on your behalf if others disagree with your choice of treatment. In Alabama, the document specifying the agent that would make your healthcare decisions is typically called a durable power of attorney for healthcare, and the document that specifies your desired medical treatment should you become terminally ill is called the living will. The living will must expressly state that the agent may end life-sustaining treatment if the principal wishes not to be kept alive when recovery is impossible. You may change your living will at any time, but it is important to destroy old copies and enact new copies according to State law.